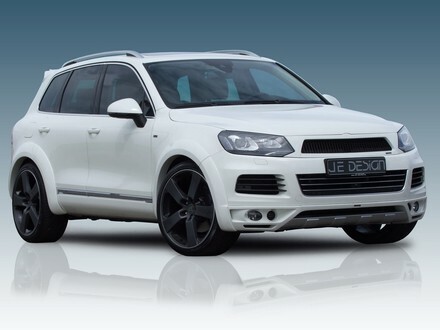 JE Design has a thorough upgrade package for the 2011 Volkswagen Touareg. The first bit, the wide body kit, is suitable for all editions of the car even those equipped with factory-fitted „Chrome & Style“ as well as „Terrain-Style“ kits. It adds 4 centimeters to the width of the car and includes sports radiator grill, front spoiler, front and back wheel arch kit, rear apron insert, roof spoiler and rear hatch blend. The engine upgrade however is currently available for the Hybrid and 3.0 liter diesel models. The hybrid Touareg gets a power bump from 379 hp (279 kW) and 580 Nm to 440 hp (324 kW) and 630 Nm just through its 3.0 liter TFSI engine. The diesel too gets 285 hp (210 kW) instead of 240 hp (177 kW). Other parts of the kit include 10×12 inch aluminium wheels available in three different finishes and H&R professional pneumatic electronic suspension whic lowers the car by 35 mm.